I like to look at the big picture. And that’s why I love a great view. When I’m hiking I find myself gravitating towards the highest point in the area, whether it’s a peak or a ridge. It’s the same in cities. I look at a tall imposing building and I want to see what the view is like from there. 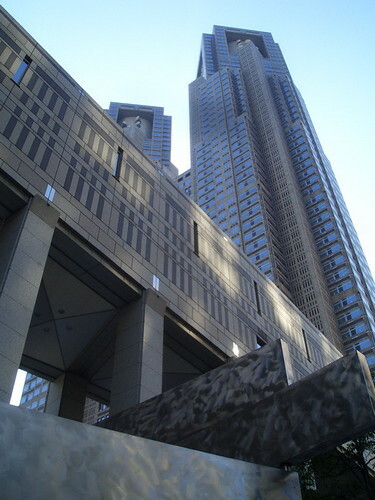 So the other day I made an overdue trek to what was (until last year) the tallest building in Tokyo, the Tokyo Metropolitan Government Building, designed by Kenzo Tange. I’ll just call it the Tokyo Met. For years, since I first moved to Tokyo, the Tokyo Met was on my list of places to visit. It was the tallest building and it was free to get up there. 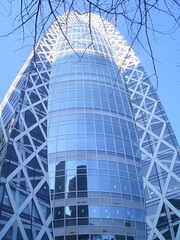 Whenever I had some extra time in Shinjuku, where the building is located, I’d make a casual effort to try to find it. But I’d always run out of time or just got lost in the maze of streets that make up Tokyo. None of my Japanese friends were interested in taking me there. Finally I strategized, found out which of the gazillion exits I had to leave from Shinjuku Station and then charted out a route. It couldn’t be that hard to find the tallest building in the area and it really wasn’t. It’s pretty much a straight shot out of the station. Of course, it’s the journey that’s interesting, not so much the end destination. 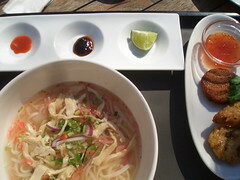 And on the way I stopped off for lunch at a chic little eatery with Southeast Asian cuisine. Sorry forgot the name. It had the obligatory GQ head waiter with the tarento smile, and that all important drink bar. The neighborhood is all business. Black suits and company name tags hung from everyone’s neck. But in the restaurant I only saw young women, perhaps job-hunting, reading little anonymous books. In short, I was completely out of place. But the food was good and reasonable. This area is the heart of the skyscraper district, and there were many interesting buildings around. One building stood out. It was still under construction but it looked like a terrible copy of the London Egg, with criss-crossing bands of gauze. But then I read the building description and found that it’s a future fashion and art design school. So the gauze made sense. I also liked the way the building is split open in the middle like a ripe peach. 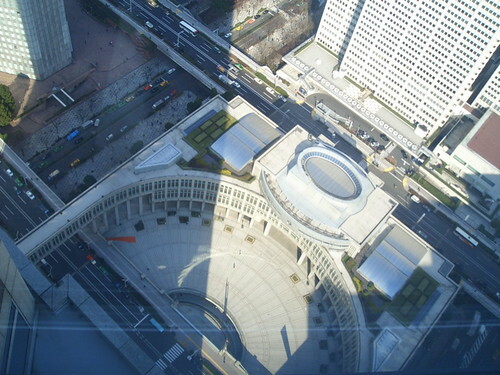 The Tokyo Met is a pair of towers that form a semi-circle around an expansive plaza lined with sculptures. 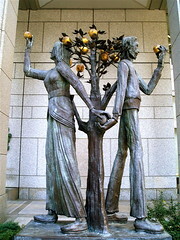 I really liked the one that I call the Tree of Knowledge. And I liked the big open space of the plaza itself. It’s a shame though because there is no life there. No natural pedestrian traffic to really make it the kind of public gathering place where protests and celebrations and people watching can happen. There was nobody there except for one quasi-homeless person napping under one of the sculptures and some stray people hurriedly walking across the emptiness. As I mentioned, getting to the observation deck of the building is free. It took about a minute on the elevator. You can go up the north or the south tower. I went up both, and the south tower is definitely the more interesting of the two. Because there were so many tall buildings nearby there wasn’t the feeling of being truly airborne like from Roppongi Hills. But you also don’t have to pay 1,000 yen either. The south tower had a very reasonable restaurant/café, and the north tower had a pretentious-looking restaurant/bar, but it too was reasonably priced. On the day I was there the view was hazy, but I could still see faint outlines of distant mountains. Overall, I recommend going there because the whole complex and the interiors are designed in the art deco style, which I love. The art deco-ness is tempered with clean lines to make it more contemporary. It’s a beautiful building. Around the building, the area is lacking in vitality and general interest outside of architecture. So if you’re not a building or view fetishist like me, you’re better off in livelier neighborhoods. Man, you’re a great photographer! You never cease to impress me bru. I’m going to Hiroshima and Kyoto next month. I’ll try to take tons of pictures and put them on my blog. Japan through the eye of Kazz. I’ll see you very soon. Good on you! I still need to go to that government building! Just like you, keep telling myself I should! but something always comes up! actually kaz, i have a photographer accompany me at all times. i point at stuff and he starts snapping away. i yell “zoom in!” or “detail!” or “wide angle!” and he goes to work. it’s awesome. you should get one.